Litchi Treatment System is a specially developed process that allows the litchi to maintain its attractive red color for a far longer shelf-life. 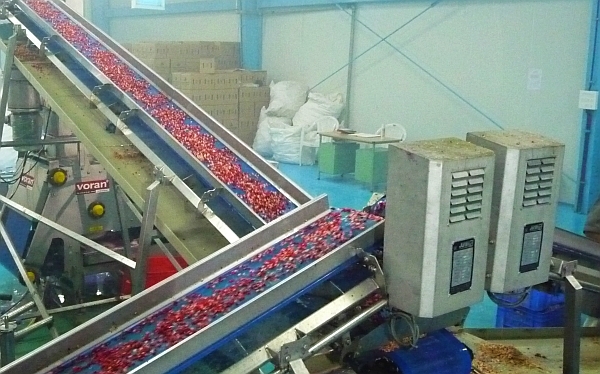 The treatment system also sorts and grades the fruit as it is moved along an automatic conveyor. Fresh Defrost is a revolutionary freezing system that will keep fruit and berries on supermarket shelves year round and worldwide since vulnerable fruit can now be frozen and defrosted nearly as good as fresh-picked. ArilSystem and ArilSystem Juicer is the world’s first commercially viable, efficient and cost-effective method for extracting arils from pomegranates and for producing a superior, tastier juice. Heat Processing Equipment – Juran produces a range of dehydrators, ovens and dryers for fruit and vegetables from single and multiple conveyor dryers to multi-purpose dehydrators and complete lines of ovens, dryers and roasters for the food processing industry.